You know those plastic mesh bags used to package some kinds of produce? Around here, lemons often come in this stuff. 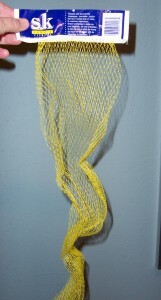 Potatoes come in a softer nylon-like mesh bag. Here are two handy things to make with the cast-off bags. The relatively stiff plastic-like mesh makes a fine scrub pad. Some time back, I came across a household hint (forget where—sorry!) to the effect that you can fold or wad the stuff up and use it to scrub pans, including Teflon. This does work, but the pad tends to spring apart unless you take time to sew it together. One day, though, it occurred to me to drop a sponge inside the tube-like bag and tie a knot on either end. Voilà! 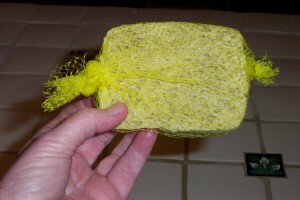 A DYI scrub sponge! The scrubber is a fairly gentle number—nowhere near as ferocious as a sponge with a green nylon scrubber attached. It doesn’t seem to scratch and isn’t great for heavy burned-on gunk, but it works fine for everyday clean-up. I cut off the label end of the nylon bag, shoved the sponge inside, tied knots on both ends, and trimmed off the extra mesh. My washer drains into a utility sink, instead of straight into a drainpipe. This poses a potential nuisance: dog hair and lint could easily clog the little drain in the sink. You can buy sock-like strainer gadgets that you secure on the hose, but a) they’re kind of expensive given that b) they clog fast and can’t easily be cleaned and re-used. Well. You know, those strainer things aren’t significantly finer than the mesh on a nylon or plastic produce bag. That’s r-i-i-g-h-t! All you need is a metal twist tie and a throw-away mesh bag to make a laundry hose strainer…for free. Knot one end (or leave the sewn-on label in place), and thread the metal tie through the mesh near the other end. 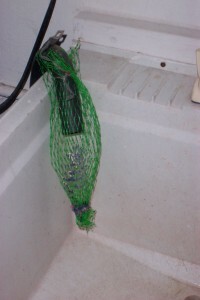 Pull the mesh “sock” over the end of the hose and secure it firmly with the twist tie. I find this works well to catch dog hair, lint, and shredded forgotten shopping lists. Do not, however, even think of putting this lashup on the end of a hose that fits directly inside the drainpipe. No. Only your plumber will thank you if you try that trick. But if your hose drains into a sink—no problem! Pingback: financial wellness project » diy jubilee #2: cold winter days edition!